IT’S GOING TO BE a long, cold winter for DC’s puppet regime in Ukraine. And Putin can sit back and watch the snow fly. With winter approaching and the Novorossiyans winning in East Ukraine, the stooges who run Ukraine’s dysfunctional government are in a panic attempting to bring Europe into “full scale war” with Russia. And the Jew-ruled idiots who are leading Europe into ruin, namely Merkel, Hollande, Cameron, and Tusk are touting the Jewish script: More sanctions. More Nato troops on Russia’s western border. 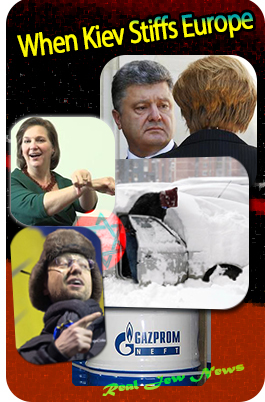 It’s right out of the playbook of the Jew-run US Treasury and Jew-ridden US State Department where Christ-hating Jews: Jacob Lew, David Cohen, Victoria Nuland, (born Nudelman), and Robert Kagan find life not worth living unless they make life miserable for Christian Russia. No wonder Nudelman loves Yats. He’s a liar just like Nuland and her fellow Jews who own the Western world’s main stream media. Whenever a Jew like Yats speaks, one must decode the encrypted Jew-meaning of the words. So when Yats the Yiddela spews, “Russia plans to cut gas to Europe,” what he really means is, “Kiev plans to siphon Gazprom’s gas and steal Europe’s energy resource…for at least the 4th time in two decades. Russia is bending over backwards to ensure gas deliveries continue to Europe. Gazprom is cooperating with the EU in every possible way to make sure enough natural gas goes into storage facilities in Europe, at Gazprom’s own expense. Both Russia and the EU are in negotiations trying to get Ukraine to pay what it owes for gas, despite the Jew-owned media’s ‘hate Russia love Ukraine‘ campaign. But Yats and Jewry’s lame ‘prez’ Poroshenko—he fears assassination by the ultra-nationalists who run Kiev’s internal security and military—can’t get their story straight. Both claim that separatists are sabotaging Ukraine’s economic stability yet Kiev is bombing Eastern Ukraine, bringing key industries to a halt and crippling coal-based electricity production. 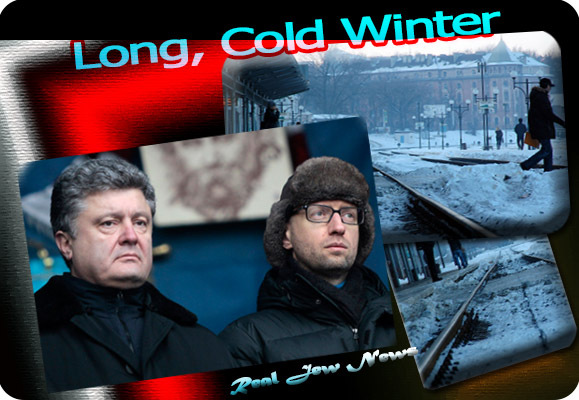 NO GAS AND NO COAL for Kiev means a long, cold winter. Europe will get their gas but Kiev’s goons will be chopping wood. Let the ukies freeze so long as commerce stretching from “Vladivostok to Lisbon” is fractured and Europe zaps its last hope for economic revival: Trade with the Russian bear. Europe is STUCK with its Jew-enabled DYSFUNCTIONAL government in Kiev. They are LIARS, CON-ARTISTS, THIEVES, MURDERERS, and down-right DEADBEATS. Ha ha ha. The last laugh is on the JEW-RULED West. Yes, that’s right. JEWS have caused CHAOS throughout the world with their warmongering, regime-changing program that Jewmerica and the JEW-U enact. JEWS rule the West and the world is a SORRY place for it. Who tells you this? Paul Craig Roberts? Naah. He says “presstitutes” and the “US military-security complex” rule the world. How about Gerry Celente and Al Jones? They says “elites” and “globalists” rule the world. How about Brother Nathanael? He ASSERTS and PROVES that JEWS own the media and that JEWS rule the world. That’s why I get tons of hate mail and death threats daily. Because those who do are CERTAINLY telling the TRUTH. Help Me CONTINUE My Articles & Videos! Thanks again for a terrific, well-researched Article about what a bunch of truly dysfunctional, lying, deceitful good for nothings that the Euromaidan “leaders” Tymoshenko, Poroshenko, Yatsenyuk and Klitschko turned out to be. It is certain that the current Kiev puppets-that-be Yats and Poroshenko and their elite oligarch cliques and political clans won’t suffer over the winter from either natural gas shortages, or electric power outages. Certainly not Governor Igor Kolomoisky who prefers to govern Dnepropetrovsk oblast from Switzerland most of the time, or Gas Princess Tymoshenko in one of her mansions. Yats’ mansion is in the same residential neighborhood as disgraced Yunukovich’s mansion is — reportedly some 300 yards away. Poroshenko’s mansion looks like the White House in DC was its architectural inspiration. And, it is no exaggeration that the average Ukrainian even outside of the afflicted, war-torn Donbass-Novorossiya area is going to have a very hard winter. With natural gas shortages central heating may not be in place in Ukrainian flats for the cold winter. While people are rushing to buy electric heaters, authorities have issued brochures with advice on how to cope with freezing temperatures. Recognizing that it is extremely hard to keep a city flat warm with no central heating, Kiev authorities, for example, launched a campaign aimed at informing citizens on tricks and methods they could use to save energy and heat – at temperatures of -10 degrees Celsius and lower. Relying more on the electrical grid and its decaying infrastructure for heat isn’t any great solution for the Ukrainians, either. “Start chopping wood” is no exaggeration. With so many heating devices power consumption will increase and may overload the grid, authorities are also giving advice on electricity savings: from switching to lower wattage light bulbs, to giving up on devices’ stand-by functions and instead unplugging them completely. Among the more extreme advice, the authors of the brochure suggest that the Kiev residents should use their balconies as fridges, and turn on the lights only in one room, preferably pointing the source of light only on one spot – for example, a table. There are some kitchen suggestions too: people are advised not to wash dishes in running water, and to eat only the types of food that take a few minutes to prepare. Meanwhile, the Ukrainian government started an aggressive propaganda campaign called “Energy independence”, the aim of which is to inform Ukrainians about the necessity to save energy and natural gas – in order to become independent from Russian supplies. It is noted that the funds for this campaign aren’t allocated from the federal budget, but from donor programs from the EU and the US. The vice premier of the country Vladimir Groysman [a Jew who won’t have to follow his own advice] has suggested the population remember how to heat their homes with wood waste, turf, and straw – and this is seriously being considered by experts. There’s a fix to all of this, Yats. Instead of coming up with numerous schemes, deceptions, and propaganda lies to keep from doing so — it’s called “pay your utility bill”! The EU countries participating in the “reverse flow” scheme aren’t doing it for free, they are selling their gas to Ukraine at premium prices. Indeed, if those countries get stiffed by Kiev, they will blame it on Putin, but sympathy for Ukraine from these reverse flow suppliers will no doubt go out the window the minute that happens. I doubt any of the supplier countries would have near the decades of patience that Russia has had putting up with Kiev’s shenanigans. God bless you dear +BN, and thank you again for an eye-opening Article. It really cracks me up to watch the alphabets AND FAUX’s so called reporting of facts. Maps, graphs and photographs that look like they were made from a 1918 Sopwith Camel and a Brownie camera that are suppose to be the “PROOF” that Russia has invaded Ukraine? Generals, UN and EU political crisis pushers screaming that they “NOW HAVE THE PROOF”?! I have neither seen nor heard one iota of concrete evidence to support any of their assertions or accusations. We live in a time when we can take spot perfect photographs of distant planets and stars but all that we see from our “ADVANCED” spy planes, drones and satellites is a blurry “could be anywhere” presentation. Do not underestimate the cunning craftiness of the F,UK, and US alliance of oligarchs persuasion of false societal opinion forming insanity. The F,UK,US alliance is the UN’s top dog’s of deceit. The scary thing is that most Europeans and Americans are completely gullible to their sorceries and witchcrafts. Thank you Brother! Great article. President Putin recently said up to 85% of (murderous) Bolsheviks were Jews. (I don’t know the exact quote). I wonder what’s the percentage of Jews among the Illuminati. Winter in the Ukraine is no joke. It’s a Continental type of weather, so minus 40-50 grades Celcius happen often. Europe, herself chronically on the brink of economic collapse, will have to tighten the collective belt much more, which could lead to revolts in different places. All this providing that the war does not get serious on this side of Christmas. Poland is sending “humanitarian aid” to Ukrainian army: food and everything sort of munitions and weapons; everybody there is aware, that this equates to regular military assistance. Very illuminating article Brother. Nobody has so far put this more succinctly and black and white. Thank you! Another excellent opinion from Brother Nathanael. And yes, so long as Zionists can (and will) spew their frustration and hate around the globe, this will be a long cold winter. Not strange as their master and father is running into full gear to get what he can get just fefore the second coming of Jesus Christ. Lucky for everybody is that there is a limit on out of the sky to blast Malaysian airplanes, as they (Zionists) must search constant for an other opportunity to get what they want. Lessons Learned, forget it. And so will all normal decent Christian people forget them. Forever. Ask the people of Syria, Iraq, Libya and Afghanistan. Ukraine is next on the list. It does appear that Putin has played their game, and won. When I heard of the resistance offensive extending their area of control along the coastline to connect with Crimea, I was elated. Why the Ukrainian people would wish to join a bankrupt, decadent, communist state of E.U. I do not know. The only thing they will receive from them is austerity, war, and plenty of Muslims, from Africa, and Asian Muslim’s from Pakistan, to overlord them and destroy their culture, and heritage. I do believe the time period of communist Jewish control of Russia, and their control of Ukraine during that period is part of the problem. They must realize that Jewish control now resides in the U.S., and the E.U. Below is an interview of senior separatist commanders shown on Novo-Russia TV. Nothing slick and sleazy about the presentation–totally down to earth. The separatists appear to be hammering the Kiev army. When asked if Russian army units were assisting them they replied that if this were the case the front-line would by now be Kiev! It looks like Putin has made the NEOCONS look stupid once again–Western Ukraine is facing a complete collapse this winter and the people will soon realize that Nudelman and Co have used them all along. Thank you Brother Nathanael for all your work on exposing the dirty Jews and their schemes to bankrupt our countries and especially us. I have personally experienced their vile touch on other media formats (Facebook being one) and I hope they will get their just deserts from God. The Zionists criminal bankers want Putin/Russia to be isolated from the rest of the world, because Putin has been a “naughty boy” with respect to the Zionist plans of owning the entire globe. Putin prevented a NATO invasion of Syria, and Putin saved the South Ossetians during the Georgian-South Ossetian “conflict” (Jewish wikipedia word used to cover up the war crimes committed by Mikheil Saakashvili and his Jewish military advisors, the bloody murderous attack of the Ossetians). The way to do this: design a civil war at the Russian border. Gas deals with Putin’s Russia must be off the table. Let me tell me this to the Zionist criminal liar and war architect: you are a total failure, you are only destroying life, humans, biosphere one, and you, little scheming and lying Zionist, you will perish as well in the end. You cannot win anything by destroying the entire planet, for instance by keeping everybody addicted to fossil fuels, by destroying the Fukushima powerplant ETC… You will fail. I hope Germany and Holland will experience a very cold winter without Russian gas to keep us warm. I’ll buy a woodstove asap for the winter and use local wood! You both, and your EU criminal buddies, can go to hell, and historic victory to the Russian Orthodox Christian Vladimir Putin resisting the Jewish Zionists. He is our only hope. Who is Anne Applebaum, the author of Hoff’s article from Washington Post? Wikijew-pedia tells us that she has written extensively about Communism. Of course war is not a bad idea when there are plenty of Goyim around ready to be rope-a-doped by Jewry to go fight their wars for them. “Anne Elizabeth Sikorska is an American Jewish journalist and Pulitzer Prize-winning author who has written extensively about communism and the development of civil society in Central and Eastern Europe. Tim Rifat, and older fellow who lives in England, is even blunter than you. The church of U.S.A., the English speaking world-wide, must be alerted about their Zionism in relation to their end time beliefs. They follow the doctrines of British John Nelson Darby who introduced them beginning in 1828, when he published such having copied them from a Jesuit - both authors following Jewish Kabbalism. Let all note carefully the words of Jesus Christ. He, contrary to those who idolize and support the Jews, issued the most disparaging and condemnatory of remarks against them, the Scribes and Pharisees who followed their own oral traditions rather than the Law of Moses. Jesus replied to them, Jn.8, and v. 22 named them as ‘the Jews’. V.31 He isolated ‘the Jews who believed in Him’ but from v.33-59 He again directs His attention to those anti-Christ ‘Jews’. He said: ”You (Jews) are of your father the devil, and your will is to do your father’s desires. He was a murderer from the beginning and has nothing to do with the truth because there is no truth in him. The character of today’s Jews remains the same. The devil is nothing of good but murders and lies continually. So are his children, today. They do not follow our Christ neither our Christian Old Testament Laws. Rather the Talmud and Kabbala of Saran, impregnate their desires, thoughts, ambitions, drive and actions, particularly against Christ and holiness and against all Christians in every church in every country, surely in U.S.A., Britain and her colonies and Russia. Indeed no one on the face of the earth is exempt from this. That surely includes lies all the time and certainly on our television screens and newspapers. Look at the genocidal murders of millions, thousands upon thousands in the past days. Surely you can see the newscasters spout different statements that do not add up? Or are you willingly blind instead of following Christ who is Truth and ‘enduring to the end to be saved’? Lie after lie. Christians you are in receipt if continual deception and lies springing from those you esteem your ‘brothers’, the ‘people of God’ when they are His avowed enemies. How can you be in bed with your enemy, acting insilence as traitors to your Lord and Savior, Jesus Christ? Is there any possibility that you could clarify the difference between Zionists and Jews? Are they not two separate philosophies but very closely tied together? I have come across Jews on the net who do not agree with a holy land specifically for Jews, and who condemn the state of Israel and their treatment of the Palestinians. I ask because we can see that even non Jews, such as John McCain for example, can be guilty of Zionist Israel loyalties. It seems to me that grouping all Jews together as bad people is like saying all Arabs are bad people because of the radical terrorists that give them all a bad name. Just trying to figure out all this madness. As a fellow follower of Jesus Christ, I have nothing but respects for you and the work you’ve put into the ministry. But I’ve read John 8 many times, and you’re making 2 separate distinctions between the Jews in John 8, that I’m not seeing. Jesus continued to talk to the same Jews who believed in him from verse 31, who he told; you will know the truth and the truth will set you free. The Jews, who believed, answered in verse 37, that they were Abraham’s descendants. These Jews may have believed, but it wasn’t in their heart to receive the word of God. This was their down falling. You have to both believe and accept Jesus Christ. Thank you for everything you do Brother Nathanael. I appreciate being able to find actual news in this upside down world. You are truly a blessing to us all. Suicide by reality (in this case called “Winter” …). Excellent. Back during the days of Columbus and the torture ceremonies of the Inquisition, there was a mass migration of Jews to Texas. These oligarchs organized two companies — one Halliburton the other Blackwater. When it comes to energy, they are “too big” to totally disappear in the fog of media frenzies. It’s just a hunch, but I suspect there’s a connection. Putin has oligarchs to contend with inside Russia as well, as well as Ukraine, as well as Halliburton setting up bases all 360 degrees around the Caspian Sea. Whoever controls the Caspian will control central Asia. BN+ you are a light in an ocean of darkness. Keep up the good work. Thanks BN for illustrate us with your articles and again you nailed. If all America PROTEST and ask for a ZIONIST CONTROL ACT asking for a total and radical separation of all JEWS from the State and make illegal Zionism and NATIONALIZE (I love your idea) the Jews-Owned-Medias. Still we have a chance to recover America and bring it back to the U.S Constitution. This is a real possibility and Jews are SCARED TO THE HELL, because they know, we are knowing and they have been faced-off (Again). This one is for Obama and all the JEW WORLD ORDER TERRORISTS. I don’t see any serious Zionist involvement in this conflict. The Jews are everywhere, I know, but this conflict seems to be more geopolitical than ideological. I think your research of this conflict has been good as always but it does not seem to me to be the best discourse of the problem. 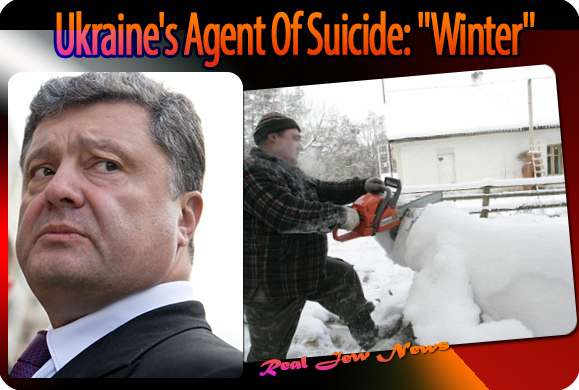 Do you think it’s possible the taxpayers of the Western world will be called on to help keep Ukraine warm this winter? That our gas bills will go up due to gas being diverted from our facilities to Ukraine? Or that maybe we’ll be expected to “share the cold” with them? Strange how fast the Jewlitists made common cause with the heretofore reviled Ukrainian “Nazis” once they decided Ukraine was ripe for the picking. Brother Nathanael hold on, we love you. Your definitions of NATO and ISIS are right on target. As usual, Brother, you are among the staunchest opponents of Jewry; and, we look to you, as a former Jew, to supply us with the Truth day in and day out. Having been raised in a Jewish family, you have first-hand knowledge of the secrets of Jewish power and deceit; and, having converted to Orthodox Christianity and became a monk, you have exposed Jewish treachery to plenty of people willing to listen and read your exposes. Your latest article on Jewry’s attempts at total control of Ukraine is a masterpiece. Bravo, Br. Nathanael. The Lord Jesus has your back; He knows how vital your work is, and is ensuring your success. May He continue to bless you throughout your mission. Western elites = Synagogue of Satin JEW WORLD ORDER Communist Dictatorship Fraudulent SCAM False Flag. All part of the Godless Lucifer NEW WORLD ORDER Communist Dictatorship. I get a kick out of that horrid look on Poroshenko’s face (pic at top), as if he cares about the people of Ukraine. His only concern is quality service to his Jew masters. Like Obama, Bush and nearly all the rest, he’d sacrifice himself, his family, his country and the entire world in service of his Jew masters. This is an evil that is very difficult for the natural (not Judaized) mind to comprehend. In the picture at the bottom of the article. Is, Nudelman making a “quenelle”? If you are getting death threats it is because you are not only telling the truth but from the point of view of the Jews you are a Jew who converted to Christianity and that makes you a traitor to the Jews. When the class Jew came in he had an emotional reaction to what was written and demanded to know who wrote it. He got no answers. If you are good they will try to assassinate you! How many good people have the Jews assassinated? The most famous was Jesus who was killed by the Jews through the agency of the black mailed Romans. If they would do it to Jesus they would do it to anyone including you. Someone asked, why do the Ukranian people rather chose to side with bankrupt Western nations, instead of staying with Russia, the nation that up to now has been the most helpful of all. Let us not forget that Russia was totaly ruled since 1917, until the Berlin Wall came down in the early 1990’s, by the same Jews that invaded Palestine, the United States, and Latin America while trying to flee from the so called world crimes against humanity, which were actually caused by the Jews themselves. And the eastern Europen people were so deeply indoctrinated and terrorized by the Jews, that in their minds they still believe that Russia is under their control. That is how bad people that get brainwashed behave, even after more than 20 years after the Jews left Russia. And the ones that stayed were either kicked out of Russia, or have been sidelined as to not be permitted to hold public office of any kind where that power can be exploited to their own benefit. That is why without knowing the Western Europeans, West of Russia prefers to trust what used to be a Christian government that was fair and willing to help, but was usurped by the Bolsheviks in Washington, DC. By media control in Eastern Europe and America, the truth is never revealed. That is picture perfect of what will happen to the American people if the criminal Jews ever get kicked out from America. The Jews will leave the population, especially the so called Zio-christians which will go to their graves believing that the Jews are the “Chosen people” of God. This video explains what the US has been doing in Ukraine and the reason for it. The Full original video entitled “US to attack Russia in 2015. Evgeny Fedorov”, does not mean the US will attack Russia as Germany did with a full scale attack. Rather they will attack Russia in more subtle ways through propaganda and terrorism hiding behind other sources instead of openly sending in troops. In this way the American public will be kept in the dark as well as some Russians who who will be brainwashed and become useful idiots in overthrowing their own government in an “Orange Revolution” fashion. The 1917 revolution succeeded for a while but eventually failed thanks to Christ’s intervention. This new revolution by the US in Russia will also fail, leaving America in dire straits. Christianity never is included in their equation. Verse 2 of John 8 speaks about all the ordinary people. Verse 3 speaks about the Scribes and Pharisees, a class of people. Verse 30,31 out of the former class of verse 2, were many who believed in Him. Verse 37, at that time it was generally the Pharisees, leaders, who were often seeking to kill Him but here included those Jews who did not believe. They were of the seed of Abraham naturally. V.39, spiritually they were not Abraham’s children. (Two Israel’s as in Rom. 9:6-8). V.37 Jesus is speaking to those who sought to kill Him, the Pharisees. V.41 They thought they were in a spiritual Israel with God their Father. V.44 Then Jesus said the devil was their father making them the seed of Satan.